It's the countdown to San Diego Beer Week! 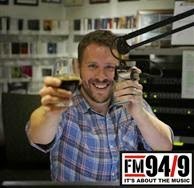 FM 94/9 craft beer fueled Rock & Roll Happy Hour takes to the road for the next 5 weeks, broadcasting from brewery tasting rooms across the county. During each broadcast we'll give out a secret discount code to get $15 off Premier Access tickets to Guildfest! Come out and have a pint with us!